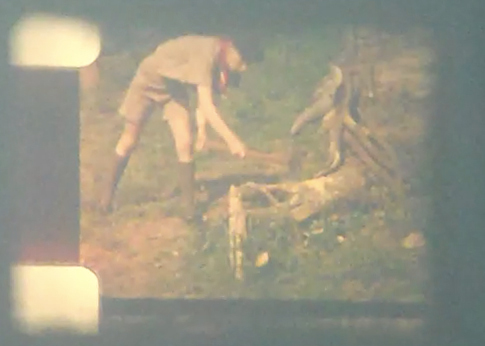 Video still, from projection of Ken Jones’ Standard 8 films, at Know Your Bristol, June 2012. Knowle West Media Centre. I’m Angela Piccini and I’m coordinating this strand of the On the Move project. Bristol University is working with Knowle West Media Centre, the National Film Archive, Bristol Records Office and scholar Peter Lewis to explore how communities can use film and video archives to tell their own histories of place. Film and video can show people how landscapes have changed over time. In the moving image you may see buildings that no longer exist, shops that are now houses, and ways of inhabiting your neighbourhood that may no longer be recognisable. For me, this project is an archaeological one as it concerns the material remains of the past in the present. More than just recording what might be called an ‘archaeological’ landscape, however, these film and video archives are swiftly becoming part of the archaeological record. So, film and video archives can show you archaeology and they can also be archaeological artefacts themselves. In this project, we are planning workshops that explore how film and video archives can help us to understand movement and change across Knowle West, which will add detail to Bristol’s Historic Environment Record and inform future planning decisions. To do this, we’re working with two very different kinds of archive. First, we’re digitising 20 hours of video from Peter Lewis’s pioneering Bristol Channel community cable TV experiment from the early 1970s. Inspired by the National Film Board of Canada’s ‘Challenge for Change‘ programme, Bristol Channel adopted a community access approach to programming, aiming to democratise media production but somewhat at odds with the commercial motivation which led Rediffusion, at the time the UK’s largest cable company, to launch the service on its Bristol network. (Peter Lewis, 1976, ‘Bristol Channel and Community Television, London: Independent Broadcasting Authority). Knowle West TV was developed to test a decentralised media model and some 40 hours of broadcast were produced and transmitted between 1973 and 1975. We’re working with people in Knowle West who participated in KWTV or who’ve lived in the community for long enough to recognise participants and locations. The digitised video will be archived by the City of Bristol and Knowle West Media Centre will bring this material into the community via the University of Local Knowledge. Important place-based information will be registered through the Know Your Place & Map Your Bristol tools in order to involve this community archive in the planning process. Secondly, we’re organising home movie workshops. These are public events specifically for residents of Knowle West who will be invited to bring their home videos (VHS, Hi-8, miniDV) and film (Standard 8 and Super 8). There will be archival expertise on hand from the City’s Record Office to look at these materials in order to assess whether it’s safe to play them on the projectors and decks. We’ll also be sharing tips on how to preserve and digitise your own home movies. We’ll aim to digitise what we can on the day and identify other material for future digitisation. As with the KWTV material, these domestic archives can be uploaded to the University of Local Knowledge and also accessed via the City’s mapping and planning tool. Key to these events are important questions about the role of people’s personal archives within the public sphere of planning and local history and archaeology. What does it mean for your family records to enter the public domain and to be accessible in new, distributed ways? How might sharing these archives benefit communities? Equally, how might such sharing throw into question older understandings of the role of neighbourhoods and the city? Are there any photos of buidings which were destroyed to build Knowle West? Like Queensdale Farm,Starveall Coittages, Queensdale Cottages etc.? The project doesn’t have any of these photos, but I suggest you check out the Bristol Record Office online archive: http://archives.bristol.gov.uk/. Knowle West Media Centre http://kwmc.org.uk/ may also have links. Let us know!